Semifreddo is an Italian word meaning “half cold” or “half frozen.” It refers to a class of frozen desserts similar to ice cream but instead made with whipped cream by churning air into the mixture while it freezes. Semifreddos are very similar to mousses and are often served in the form of ice cream cakes or tarts. There are many different recipes for semifreddo, that use different bases to mix with the whipped cream. In Italy, semifreddo is commonly made with gelato. Cooked custards and custard-based sauces, such as crème anglaise, are another common choice to mix with whipped cream to put together this dessert. The first step in making semifreddo is whipping heavy cream until it forms peaks. You want it to be stiff but not over-whipped. Once the cream has thickened, stash it in the freezer while you make the custard. Custards are made by heating the milk or cream and then gradually adding it to egg or egg yolk. By adding the warm cream to the egg a small amount at a time, the eggs are “tempered,” or heated up without curdling. Once the egg is warm, the entire mixture is returned to the heat to finish cooking. Once the base is made, it is folded together with the whipped cream. Take a third of the cream and mix it with the base, then add another third and gently fold the mixture over on top of itself to combine. The goal is to mix the ingredients completely without deflating the whipped cream. Add the last of the cream, fold to combine, pour the mixture into a pan lined with plastic wrap, and freeze until solid. Some semifreddos are served on a crust of cake, graham cracker crumbs, or other similar foods. You can transform any semifreddo recipe by adding a cookie crust to the bottom of the pan and then spooning in the semifreddo. Once it has frozen, dip the pan into hot water to unmold and serve in slices. One of the biggest benefits of making semifreddo is that you don’t need an ice cream maker or other specialty equipment to make it. 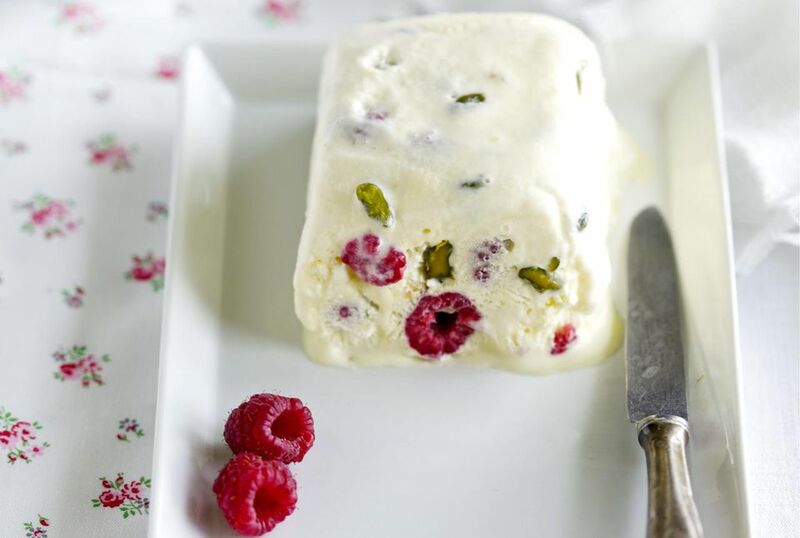 If you have a whisk, a saucepan, and some bowls, you can put together a semifreddo. Depending on the base recipe you choose, you might need some practice, but there are tons of varieties once you master the technique.